They’re 7-day stage races over the world’s most spectacular courses — in the Alps, the Pyrenees, and now also in North America. They’re the pinnacle of amateur cycling experience in Europe. Riders who’ve taken part in an Haute Route event describe it as a ‘life-changing experience’. When we heard that the Haute Route organisation planned to extend the series with a new, shorter, 3-day format, we asked ourselves “How would our Strada bike go on a course like this?” We reckoned Strada’s 1x transmission and supreme aerodynamics would make it just about perfect. There was only one way to find out! I reached out the Haute Route people to explore how a tie-up between us could work. 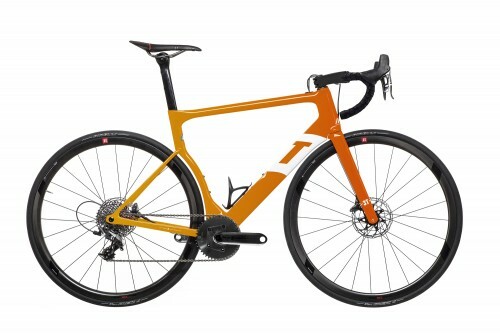 The idea we came up with was an official Haute Route Strada bike, finished in the event’s signature orange and sporting the event’s logo. 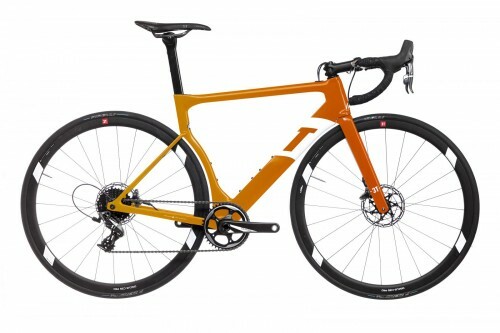 Strada Team Haute Route Special Edition with THM cockpit and Torno crank. We’ve worked quickly to turn that into a reality, and these bikes are now available to buy as part of an exclusive entry package to the 3-day Haute Route events in France this year: Haute Route Alpe d’Huez (13–15 July) and Haute Route Ventoux (5–7 October). The orange paint finish, with a ‘fade’ from front to rear, really pops in the sunshine, causing gasps of admiration on first view! The first package comprises a complete Strada PRO, together with the race entry fee, for the inclusive price of €5000. The second package comprises a Strada TEAM, the race entry fee, and full hotel accommodation, for €7800. A key advantage of the Haute Route 3-day events is that participants get to sleep in the same hotel for the event duration, with the race village and rider services all located on your doorstep. This makes logistics much easier for busy international competitors who can’t afford to take the time off for the 7-day Haute Route events — as much as they might wish to!